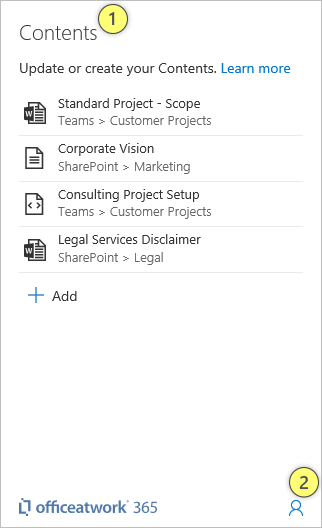 Once the «Uploader» App has been assigned to you or you have acquired it via the Office Store/AppSource, it will automatically appear in the «Design» tab of your Office application ribbon. To launch the App best click on the «Upload» button. Please note: Dependent on the capabilities of the platform the «Uploader» App might be available or not on different platforms for different Office applications. 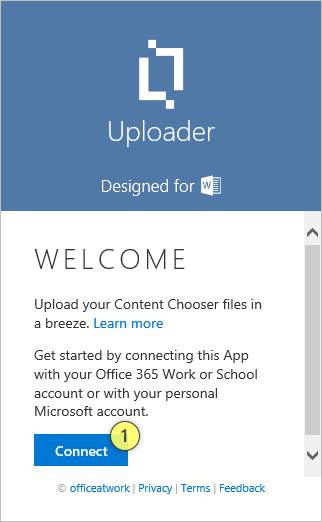 To get started with the «Uploader» you need to connect it with your Office 365 work or school account or with your personal Microsoft Account. Click the «Connect» (1) button to start the process. The actual sign in experience is provided by Microsoft. The navigation within the App is split into two sections, the «Contents» page and «User» menu. The «Contents» page (1) will list all linked contents in your document. 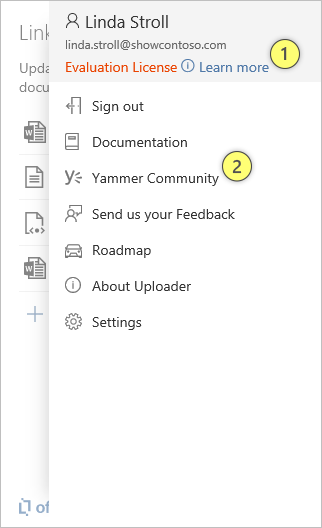 It will also offer an «Add» button that will allow you to upload your current selection as a new content and automatically create a linked item on your document in the process.